Harrisburg, PA – Governor Tom Wolf today joined Congressman Dwight Evans, Senator Larry Farnese, Representative Donna Bullock, legislators, and advocacy groups in a call-to-action for criminal justice reforms to refocus the system on rehabilitation and provide consistency and uniformity in the system. The governor was also joined by artist Robert “Meek Mill” Williams and Sixers Co-Owner and entrepreneur Michael Rubin. Justice Reinvestment Initiatives (JRI2), which seek to provide for fair sentencing, increase parole supervision and use of community-based programs, among other reforms. Bail and Pre-Trial Reforms to ensure that everyone has a right to a fair trial and that risk-assessment tools are consistent across the commonwealth. Post-Conviction Relief Act Expansion to reduce time sensitivity by increasing awareness of when rights expire so defendants can make an informed plea decision. Currently if a defendant pleads guilty, they are foreclosed from post-conviction relief; this needs to change so all defendants, regardless of plea, may attempt to prove their innocence. Probation/Parole Revocation and Resentencing to create uniformity in probation revocation procedures and ensure a correlation between risk and probation lengths, resulting in better supervision. Comprehensive Clean Slate Legislation currently being considered in the General Assembly and the first step in establishing a much more comprehensive clean slate law in the commonwealth to provide an opportunity for persons convicted of greater offenses, including felony convictions, to reenter the community with success. Indigent Defense is a critical part of the system that can have a large impact on volume, cost, and human effects and is needed in Pennsylvania to ensure the independence and quality of counsel under the Sixth Amendment. Stepping Up Initiative, which was launched statewide in April 2017 and via summit in December 2017 along with a data-driven project by Dauphin County to examine its criminal justice system, with the goal of reducing the number of people who have serious mental illnesses in the county prison. The findings from that project will be made public at the end of this month and will be used to develop policy and programming recommendations. “Leadership matters. When it comes to reforming our criminal justice system Philadelphia, the Commonwealth of Pennsylvania and our nation are looking to us to lead the path towards justice and fairness. We need to advocate for sound, consistent polices that do not waste time, money and resources, keep residents in our neighborhoods safe and promote fairness and equity for everyone in the criminal justice system. We know there is a direct connection between criminal justice reform and reducing poverty. Reforming our criminal justice system will not be easy and is not something that will happen overnight; but when we work together in a thoughtful, productive and collaborative way we can and will impact real change,” Congressman Evans said. 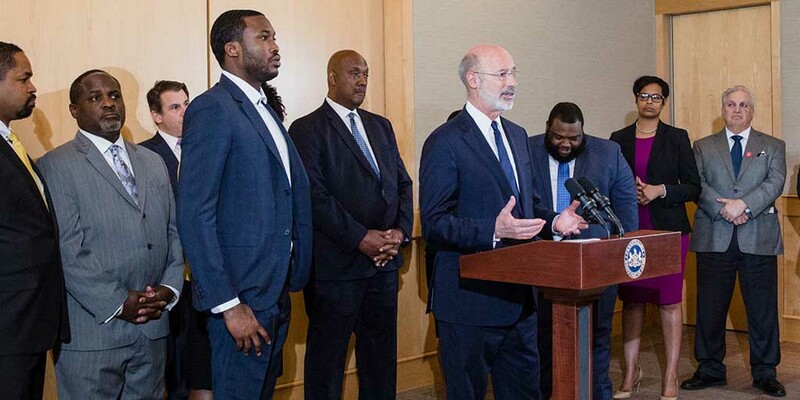 “We need to do the work to make our criminal justice system fairer, more equitable, and more focused on rehabilitation,” Governor Wolf said. “Since I became Governor, I have worked hard to reform our system so that it leads to better outcomes and saves taxpayer dollars – while also leading to less crime and fewer victims.